iRTU & iGW devices can be used simultaneously as data servers and data clients. RTU can map its I/O or the existing IEDs (protection relays, PLC, meters) into IEC61850 MMS logical devices, acting as a IEC61850 data server. 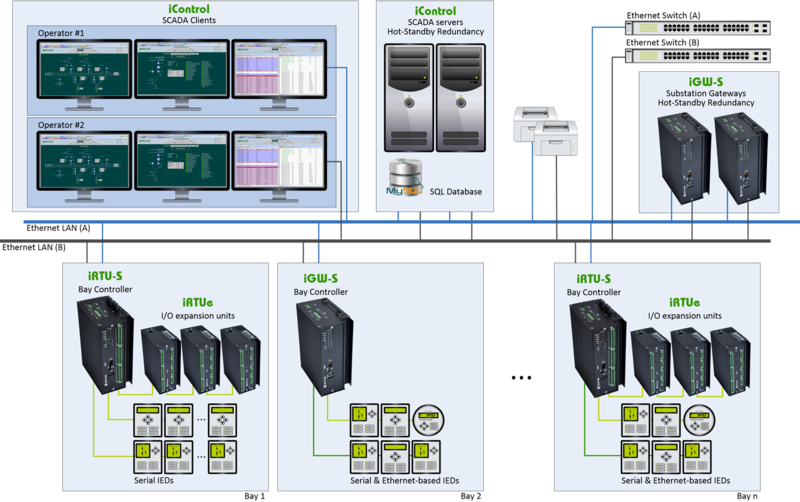 iControl SCADA collects information, in real time, from multiple IEC61850 servers, as from any other protocol simultaneously. iGW collects data from IEC61850 IEDs, using MMS reporting, and maps it to IEC60870-5-104 or DNP3.0 to be delivered to control centers. Since this standard was introduced, it has undergone many improvements and it has now matured to a point that allows interoperability of different vendor equipment. This has been demonstrated by a number of pilot projects that have automated substations using equipment from different vendors. Finally, we can now forget multiple proprietary protocols and go for a real interoperability. The IEC61850 standard means a completely new working philosophy that goes from the old serial port protocols to a TCP/IP events based system with a complete vendor interoperability. But how can your utility benefit from IEC61850 in the short or medium term? We can help you to migrate smoothly to 61850 leveraging your existing projects to expand your substations. How you will get expertise to your employees? iGrid T&D will help you make the IEC61850 the best choice for your utility. Powerful and reliable substation gateway able to run either in standalone or redundant modes, with an embedded Ethernet switch, and IEC61850 Client and Server capabilities. Intelligent and scalable bay controller with I/O capabilities for direct data acquisition, embedded Ethernet switch, and IEC61850 Client and Server capabilities. High-performance SCADA for visualization and control of substation data. It is able to run either in Client/Server or Standalone modes, with advanced functionalities such as hot-standby redundancy, automatic line coloring, events notification (via e-mail and sms), SQL logging, and reports generation. Retrofitting electrical facilities means to use the newest devices together with the oldest ones. For these projects, flexible and adaptable protocol converters are vital devices. Institution in charge: IGRID SL. Purposes of data processing: Customer contact. Archived data location: Raiola Networks SL (UE). Personal data retain period: Until removal request. Rights: You can exercise your rights of access, rectification, cancellation and opposition.